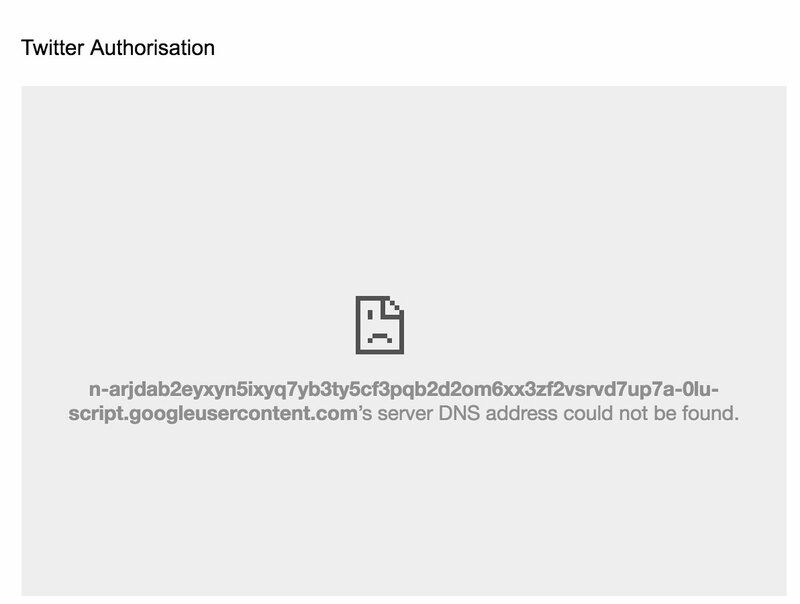 Home › Topic › Twitter authorisation not working? Home › Forums › Basic setup › Twitter authorisation not working? This topic contains 10 replies, has 4 voices, and was last updated by Ron Demichele 6 months, 2 weeks ago. I’d be grateful for any help – is this happening to everyone, or is there a problem with my setup? Not seen this one before. My thoughts are either it was a temporary issue with google servers or if your network is firewalled or your anti-virus software is interrupting the request. If you are still having problems are you able to try the setup using a different network connection? And in the class 7 students all managed to get it to work on windows like me (uni computers) and on a mac like I have personally. No problems with the browsers, network, anything. So it seems the only thing left is that my accounts are messed up somehow? Here is a screenshot of how it works, first in safari (no error message just empty screen) and then Chrome (error msg). I set up a completely new google account, and the Twitter authorisation now works, with the new google account, same Twitter account. So there must have been something about my regular google account. I have no idea what that might be though. I seem to be having an issue, using Chrome on Apple I’ve set everything up as per the instructions, gone to run my query, TAGS – run now – keeps asking to set up Twitter access, which I have, several times – keep getting the success Twitter has authenticated page – go back to TAGS – run now and it tells me I need to set up Twitter access. Keeps going round like this, any ideas? me again, managed to get it all sorted, thanks to the hubby – IT genius! Glad you got it sorted! What did you end up having to do?